Talk about culture-mashing. 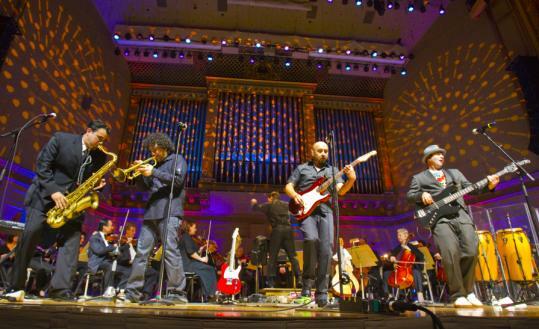 Ozomatli, a Grammy-winning, Los Angeles-based septet with five albums of globally minded dance music under its collective belt, hit hallowed Symphony Hall last night for the first of a two-night stand celebrating the Boston Pops’s 125th anniversary. Let’s just say that the band, which incorporates into its expansive sonic arsenal everything from Latin salsa and New Orleans funk to LA hip hop and Jamaican groove, knows how to throw a party, birthday or otherwise. Ozomatli made the most of its 40-minute set, which came during the last third of an evening of special anniversary music programming devoted to two of conductor Keith Lockhart’s acclaimed predecessors, Arthur Fiedler and John Williams, and spiked with early crowd-pleasers (you really can’t ever go wrong with music from “E.T.’’ or “Star War,’’ both Williams compositions). Other highlights included a star turn by vocalist Shannon Allen, who proved she was more than just the wife of Boston Celtics star Ray Allen, when she offered up a sweetly smoldering rendition of the Etta James classic “At Last’’ that instantly gave the evening a nicely romantic twist. Another early highlight came in the form of a special Beatles “Rock Band’’ sing-along to “Sgt. Pepper’s Lonely Hearts Club Band,’’ “Yellow Submarine,’’ and “Twist and Shout,’’ with film animation by the Cambridge-based Harmonix Music Systems. The streetwise snarl of a Stratocaster, courtesy of Ozomatli singer-guitarist Raúl Pacheco, is not normally a sound one expects to hear within the walls of stately Symphony Hall (although that’s changing). But backed by the Pops — or what Ozomatli saxophonist Ulises Bella cheekily referred to as “a hell of a backing band’’ — the electric instrument’s accents to the rock-rap tune, “Believe,’’ sounded especially sumptuous, as did the arabesque vocal melody lines, exquisitely sung by Pacheco, that skimmed across the top of the string section. When rapper Justin Porée exhorted the crowd to “get your peace signs up,’’ hundreds of hands flew into the air. Ozomatli is a big band as it is, with all manner of percussion, brass, voices, and strings exuberantly stirring the stew of a stylistic melting pot constantly in motion. But with the Pops, an unobtrusive yet beneficently powerful force behind the veteran unit, the cumulative effect on an up-tempo, blast-of-brass number like “Saturday Night’’ and “Como Vez’’ was akin to turning once-staid Symphony Hall into one big block party, with the audience dancing on the floor, and the house band playing the classiest house at the end of the street.